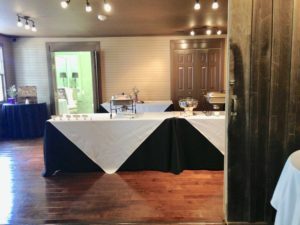 Dear Engaged Couple—I know that I am always offering up new venues for you, but I have another! 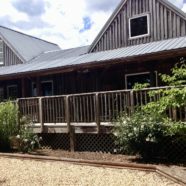 It is called Wild Wolf, a brewery in Nelson County, not too far from Wintergreen Resort, which is itself a fine venue option for your wedding. I have known about Wild Wolf for years, but it only recently became a serious competitor for other venues in the greater Charlottesville area. You may already be familiar with Wild Wolf beer. If you like the beer, then you are half way to at least making a visit to this site. I can’t say much for its outdoor space. It has an attractive exterior, but it has no vast expansive of land, a field say, on which to set up chairs and such. However, it has an indoor gathering place behind the main kitchen and table able area, which is just right for a smallish wedding reception. 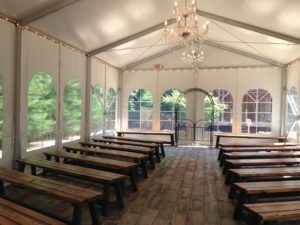 It also has a tent, just outside this large room It is set up to look like a chapel—with glamorous chandeliers hanging above, and permanent benches. A wedding chapel feel –the “wedding tent” at Wild Wolf. enough, or it was not powerful enough to cool the space. I would definitely NOT choose to have your wedding here in the hot, humid days of Charlottesville’s summer. I am not sure if the tent has adequate heating in the winter months, either. Other times, though, I think you might find this to be just the spot for you, if you are looking for a small, intimate spot in which to exchange your vows, and a reception room that is at the ready AND if you are a Wild Wolf Beer aficionado. To find out more, go to https://www.wildwolfbeer.com/wedding-packages/.